1.) number of columns and order of columns of all queries must be same. 2.) the data types of the columns on involving table in each query must be same or compatible. 3.) Usually returned column names are taken from the first query. 1.) The columns of joining tables may be different in JOIN but in UNION the number of columns and order of columns of all queries must be same. 2.) The UNION puts rows from queries after each other( puts vertically ) but JOIN puts the column from queries after each other (puts horizontally), i.e. it makes a cartesian product. The queries are all executed independently but their output is merged. In the following example, no clause have been added with UNION, so, by default UNION is acting as UNION [DISTINCT] and only the unique rows are available in the result set. In the following example, the optional clause ALL have been added with UNION for which, all the rows from each query have been available in the result set. Here in the above output, the marking rows are non-unique but it has been displayed. If ignored ALL clause, the marking rows would have come once. In the following example, the two queries have been set using two different criteria including WHERE clause. So all the retrieve rows (including duplicates) have displayed in the result set. Here in this example, the marking rows are identical, but it has been displayed for the ALL clause along with UNION. If ignored ALL clause the marking rows would have come once. In the following example, the two queries have been set using two different criteria for the same table. So all the retrieved rows ( including duplicates ) have displayed. Here in this example, the marking rows are identical, but it has been displayed for the ALL clause along with UNION. In the following example, the two queries have been set using two different criteria and different columns. The different columns in two statements are 'life' and 'pur_qty'. But as the data type are same for both the columns so, result has displayed. Usually returned column names are taken from the first query. In the following example, the union made by two queries. The queries are two inner join statement. 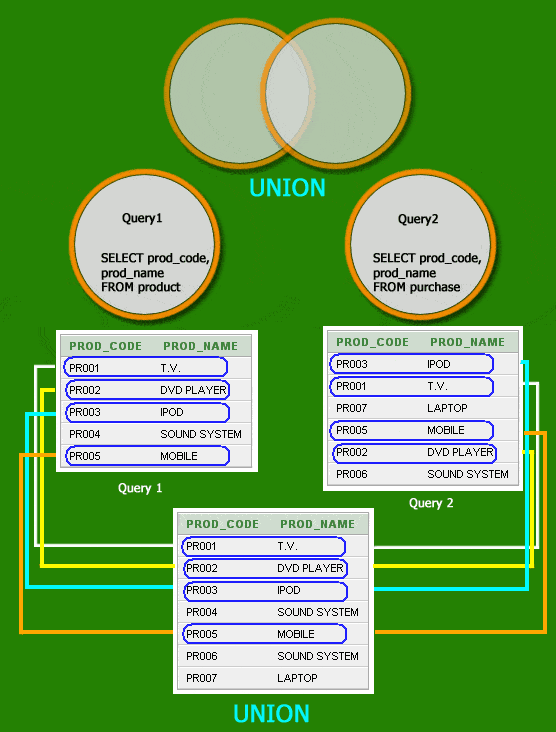 In the first query, the join takes place between two tables where the prod_code of both tables are same and in the 2nd query the join take place between two tables where the prod_name of both tables are same. The basic difference between UNION and UNION ALL is, UNION removes duplicate records but UNION ALL does not. Let apply these two commands on two tables table1 and table2.